Whiteness is presented as the norm and hence often goes unnoticed – at least to those who are white. So taking the example of the humble plaster that might seem relatively unimportant; “flesh” coloured is taken to be that which matches white skin, hence flesh coloured plasters have until recently always been manufactured in pink or peachy tones. But why when members of the human family come in shades of brown and beige too? 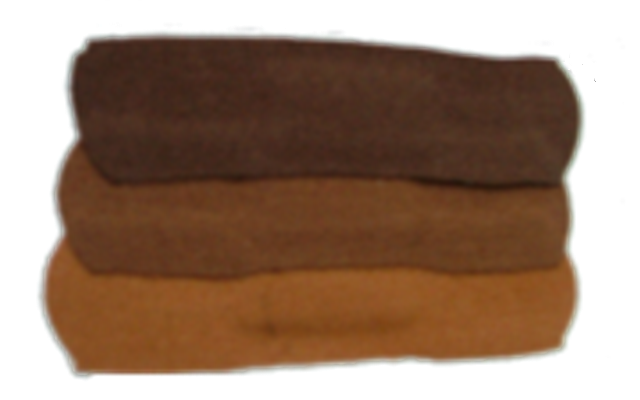 A new company called Sticky Skin wondered the same thing and so decided to manufacture plasters in three shades of brown to match skin tones of black and Asian people. I tried one out myself and it is such a good match for my skin that it’s hardly noticeable until you get close up. I remember years ago having a nasty accident where I had a large gash on my chin and had to wear a large pink plaster to work for a couple of weeks and felt really embarrassed about it, as it was so noticeable. I showed samples of the plasters to a few ebony-hued women while waiting to meet a friend at Victoria train station a few days ago and all gave the thumbs up; some expressing frustration that the introduction of brown coloured plasters is so recent. But the problem of whiteness in everyday life goes beyond plasters. As Mc Intosh notes the same applies to greeting cards, dolls, toys, books – and prosthetics. And the Mail Online reported that a black mother facing amputation was told by doctors that she could only have a white prosthetic foot fitted by the NHS. Ingrid Nichols 46, was told that there was no funding for black prosthetic limbs on the NHS and that she would have to pay £3000 to have one privately fitted. A report by Breast Cancer Care on breast prosthetic fitting services revealed that nearly all of the black and minority ethnic women in their study said they had difficulty in obtaining a non-white prosthesis. The above examples bear testimony to that fact. So while the introduction of a humble brown plaster may not be deemed that important by those with white skin who have always had access to “flesh” coloured ones in their own skintone; for people of colour, it is a dent in the armour of white privilege. I enjoyed the article. It took you back to basics and a journey where you suddenly realised how small things can lead to wide changes. There are a lot of things that we accept because they have always been there without looking deeper at what these acceptances actually say about us.